The Hindi film music had now taken a definite shape with the beginning of the decade of fifti es which is now liked most by the music lovers and is lovingly called as 'The Golden Era' of Hindi film music. During one of memorable meetings with music directors of yester-years, Maestro Hans Raj Behl had disclosed that a very healthy competition existed in this decade and many music directors used to prepare as many as 10 tunes for one particular song ! 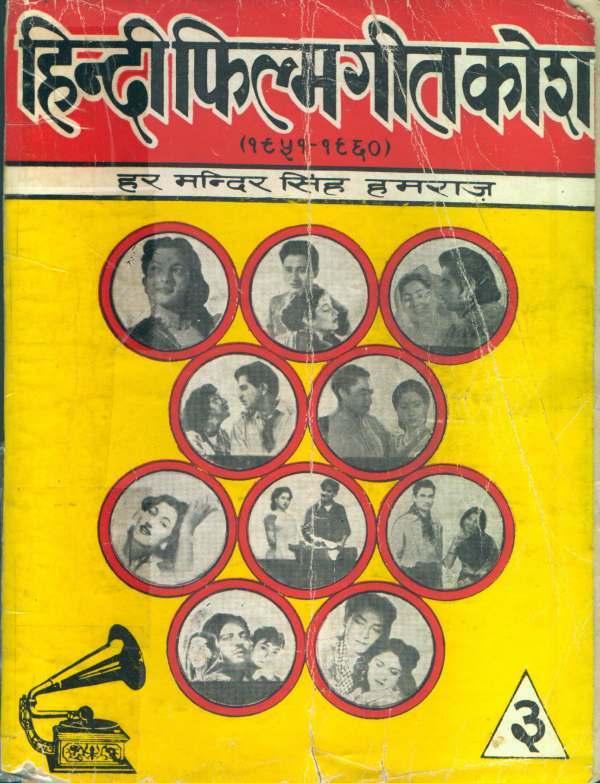 Out of the proposed 4 decade-wise volumes of Hindi Film Geet Kosh, when the opportunity came to choose one volume amongst 4 for publication, it was this volume that was selected so that information of songs of The Golden Era could be made available to the music lovers. This volume was made ready for sale to the music lovers in January 1980 and due to lack of contacts, no formal release function could be arranged for its release. 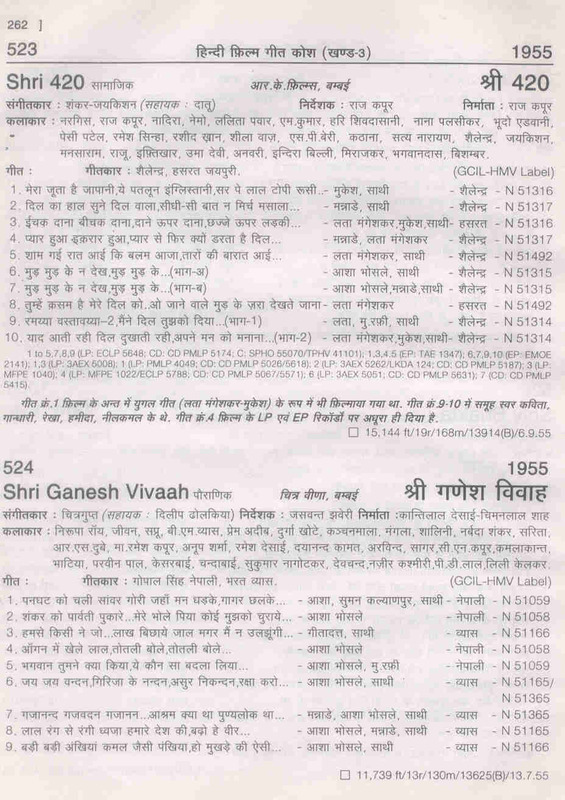 For some obvious reasons, lengthy song index was also missing in this volume and for this reason, music lovers continued complaining about it all the time till they could get the 2nd - revised and enlarged - edition of this volume which was released by Maestro Kalyanji on 5th April 1997 at Birla Kreeda Kendra, Girgaon Chowpatty, Bombay in the presence of eminent film personalities like Sardar Malik, Snehal Bhatkar, Sudhir Phadke, Lalita Phadke (nee Dewoolkar), Prem Dhawan, Gulshan Baawra, Mubarak Begum, Kersi Mistry, Ajit Merchant, Sulochana Chavan (nee Kadam), Madhubala Chawla (nee Jhaveri), Sudha Malhotra, D.O. Bhansali (sound recordist). Details of about 9,000 songs of 1,160 Hindi films censored between 1951 and 1960 has been given in 744 pages of this Volume. Prior to the release of the revised edition of this volume, xerox edition was being supplied to the music lovers since 1985 to meet their pressing demand. 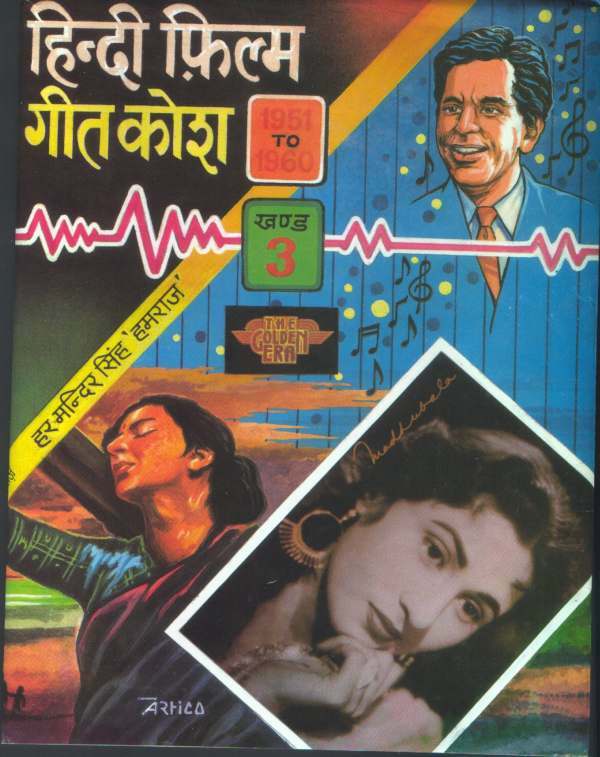 First edition of this volume happened to be the first in the series of Hindi Film Geet Kosh and its 2nd edition is the 6th and last published volume of the series. Currently, only this volume is available in original and xerox copies of all the rest 4 volumes are being provided to the music lovers. Sample page is appended.